ALMOST every Queenslander is consuming too much sugar, and most of us want a 20 per cent levy on sugar-laden drinks to help support us in our battle against the state's mammoth health scourge. Cancer Council Queensland and Heart Foundation's Everyday Health Survey findings - released exclusively to News Queensland - reveal 98 per cent of Queenslanders know their diet has too much sugar, and are trying to cut back. There was a clear link between the overconsumption of sugar-sweetened beverages and rates of obesity, CCQ chief executive Chris McMillan said. Queenslanders call for government intervention comes on the same day an Australian study reveals that young adults classified as obese can expect to lose up to 10 years in life expectancy. Under 25s are known to be big consumers of soft drink. The shock news comes from The George Institute for Global Health and the University of Sydney. 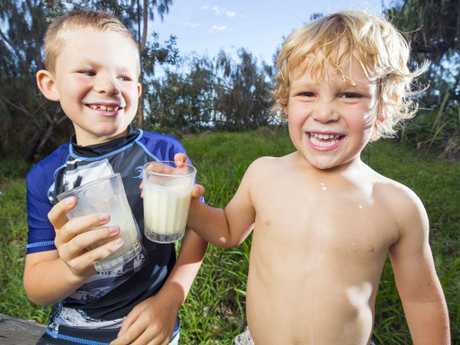 The chief health officer's latest Health of Queenslanders report shows over a third of energy intake is derived from food and drinks with little or no nutritional value. Two-thirds of the adult population is either overweight or obese, and about one-quarter of children. "We know that sugar-sweetened beverages have little or no nutritional value and may lead to weight gain, which can increase the risk of a number of chronic diseases, including heart disease and some cancers," Ms McMillan said. "Reducing the risk of obesity requires an integrated approach across different sectors, including improving the availability and access to nutritious food and reducing exposure to marketing of less healthy food options." Almost two-thirds of those surveyed were in favour of the drinks levy and the revenue raised used to subsidise healthy foods. The call for school nutrition programs came from 14 per cent of the those questioned. Almost 1300 took part in the survey. Nutrition Australia recommends water as the best drink for good health. "Add some chopped fruit or mint leaves to water for flavour," spokeswoman Aloysa Hourigan said. "A glass of low-fat milk can be easily included as a nourishing drink, especially for kids, or what about a fruit-infused or peppermint tea?" The sugar in milk is the naturally occurring lactose and is low-GI. Heart Foundation Queensland chief executive Stephen Vines said the findings confirmed the population was highly concerned about the impact of sugar on its health. "Just one can of soft drink is nine teaspoons of sugar, and can undo the benefits of an otherwise healthy diet," Mr Vine said. "Being overweight or obese greatly increases your risk of heart disease, and we want to work with community and government to find ways to reduce the consumption of sugar-sweetened beverages." Ms McMillan applauded the Queensland Government for already acting on reducing the impact of sugary drinks through restricting their presence in public hospitals and health care facilities, and for taking the lead on developing guidelines to phase out advertising of junk food targeting to children near schools, sport and recreation centres, as well as public transport hubs.